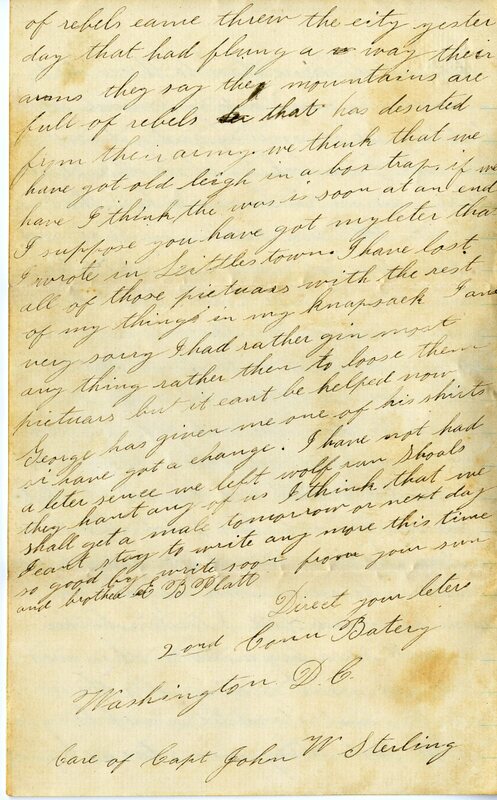 Item Description: Letter, dated 11 July 1863, from Eldridge B. Platt to his family, updating them on the injury he sustained at the Battle of Gettysburg and sharing his thoughts on the war. Click here for an earlier description of his injury and hospital stay. Platt (b. 1847) enlisted as a drummer in the 2nd Connecticut Light Battery on 12 August 1862. By 11 November 1862, he was serving as a cannoneer. He was discharged 10 August 1865. Item Citation: From folder 3 of the Eldridge B. Platt Papers #4767, Southern Historical Collection, Wilson Library, University of North Carolina at Chapel Hill. 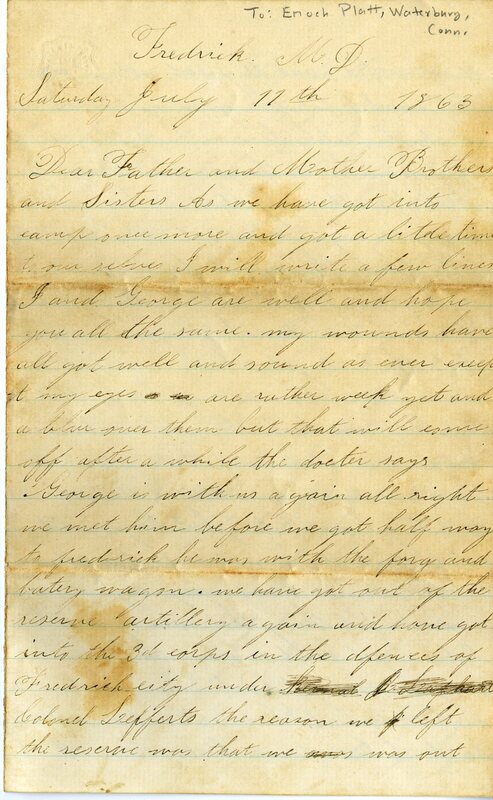 Dear Father and Mother Brothers and Sisters As we have got into camp once more and got a little time to our selves I will write you a few lines I and George are well and hope you are all the same. my wounds have all got well and sound as ever except that my eyes are rather week yet and a blur over them. but that will come off after a while the docter says. 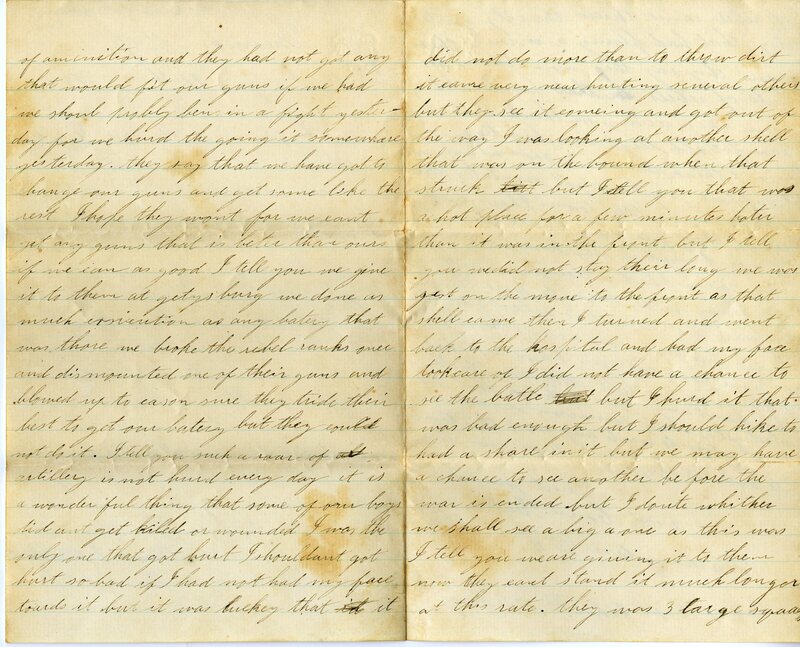 This entry was posted in Southern Historical Collection and tagged 2nd Connecticut Light Battery, Battle of Gettysburg, casualties, Eldridge B. Platt, United States Army. Bookmark the permalink.